As a poet, I believe every verse has the power to share a bit of my heart with the world. How many of those who read will understand it, I do not know, but I still believe in that. In the same way, while reading poems, I try to understand what the poet is conveying through them to me. Then again, a verse may just be a way for the poet to put down a burden from their mind, without conveying anything prolific. That’s why reviewing a poetry book is a little more tough than reviewing a fiction, at least for me. 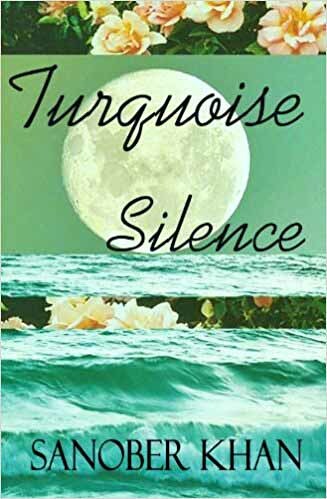 Turquoise Silence is a collection of poems that speak about life, how the poet feels about it. What Sanober feels about poetry is what I can most understand, and relate to. To quote a part of her poem, she says “I am infinitely yearning, brimming… overflowing in words. And I discover it’s another way for me to be… in tears.” I’m not putting it structurally here. Just to show you the pause. “Poetry is another way for me to be”. I felt an unsaid “me” at the end of this line, and well, they say verses come out best in sorrow, in tears, in melancholic moods. So yes, I could understand that. Then in another verse, she contemplates moments, moments that return to whisper to us, comfort us, but also to haunt. I felt a touch of memories there. Those are the moments that return often, right? If I were to analyze and explain each poem, this post would not be a review but a class in poetry. I don’t intend to do that. What Sanober does share through her verse is life and the many moments that are borne out of the many experiences that we have, the tiredness that we feel after or the exhilaration that we feel during. They are something to be sipped slowly, like cold water on a summer afternoon. It’ll make you think, that’s something I am glad that a poem does. The good thing about the book is that the language is simple and a dictionary isn’t needed often to understand it. And last but not the least, I think the cover is very beautiful. On the flipside, I think though free verse poetry can be said to have no rules to some extent, it still needs to be there in some things. Many places were there where “I” was put as “i”. And there were too many ellipses (…) in the poems as well. Thes are the small things that can work against the poet I feel, because it makes reading the poem feel very odd. The book overall has some very fine poems that I can relate to and remember. I’m thankful to have read them. However, presentation of a poem is something that I feel is equally as important. The overdose of ellipses didn’t help in that cause. I think anyone who reads poetry will love the thoughts behind the book, if they can adjust with the presentation a little. Positives: Beautiful cover, and some beautiful poems that I could understand, relate to. Negatives: Some dull parts that could have been avoided. Sanober Khan is a Mumbai-based poet and freelance writer. Her work has been published in various journals. This is her second book following “A touch, a tear, a tempest” which was shortlisted for the Muse India National Literary Awards in 2012. She enjoys reading poetry from around the globe as much as she enjoys writing them.